Botanical Name: 1. Glycyrrhiza uralensis Fisch. ; 2. Glycyrrhiza inflata Bat. ; 3. Glycyrrhiza glabra L.
Part Used & Method for Pharmaceutical Preparations: The rhizomes are dug in spring or autumn. After the fibrous roots and bark have been removed, the rhizomes are cut into slices and dried in the sun. Meridians: Heart, lung, spleen and stomach. Functions: 1. To tonify the spleen and replenish qi; 2. To moisten the lungs and stop coughs; 3. To relax spasms and stop pain; 4. To moderate the action of herbs; 5. To reduce fire and release toxins. 1. Deficient qi of the spleen and stomach manifested as poor appetite, loose stool and lassitude. Licorice root (Gancao) is used with White atractylodes (Baizhu), Poria (Fuling) and Ginseng (Renshen) in the formula Sijunzi Tang. 2. Cough and asthma. Licorice root (Gancao) is used with Apricot seed (Xingren) and Ephedra (Mahuang) in the formula Sanniu Tang. 3. Carbuncles, furuncles, sore throat and swelling due to toxic heat. Licorice root (Gancao) is used with Platycodon root (Jiegeng), Scrophularia (Xuanshen) and Arctium fruit (Niubangzi) for sore throat; Licorice root (Gancao) can also be used with Honeysuckle flower (Jinyinhua) and Forsythia fruit (Lianqiao) for carbuncles, furuncles and swellings. 4. Abdominal pain due to spasms of the stomach or intestines. 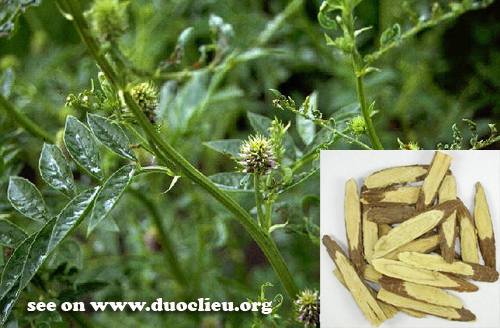 Licorice root (Gancao) is used with White peony root (Baishao). 5. For epigastric and abdominal pains, it is used with Ramulus Cinnamomi (Gui Zhi), Radix Paeoniae Alba (Bai Shao), and Saccharum Granorum (Yi Tang) in “The Minor Decoction for Strengthening the Middle Heater” ( Xiao Jian Zhong Tang). For spasm and pain of the extremities, it is used with Radix Paeoniae Alba (Bai Shao) in “The Decoction of Peony and Licorice” (Shao Yao Gan Cao Tang). 6. Moderating the action of other herbs. For example, Licorice root (Gancao) with Prepared aconite root (Fuzi) and Dried ginger (Ganjiang) can weaken the heating properties and lessen the side effects of some herbs. This combination is called Sini Tang. Dosage: 2-10 g, decocted in water for an oral dose. For clearing away Heat and poisons, it is used unprepared; for tonifying the Spleen and Stomach, it is honey-baked. Cautions & Contraindications: This herb is contraindicated during cases of excess dampness causing distension and fullness in the chest and abdominal region, or vomiting. It counteracts Peking spurge root (Daji), Genkwa flower (Yuanhua), Kansui root (Gansui) and Seaweed (Haizao). Prolonged overdosing of the herb may cause edema.